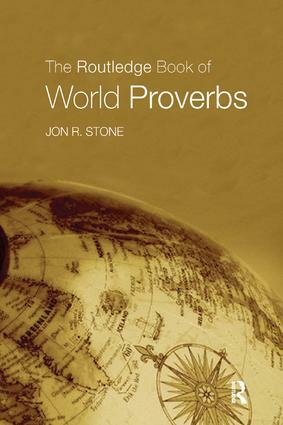 The Routledge Book of World Proverbs invites the reader to travel the globe in search of the origins of such words of wisdom, experiencing the rich cultural traditions reflected in each nation’s proverbs. This collection contains over 16,000 gems of humour and pathos that draw upon themes from our shared experiences of life. And we are not just invited to learn about other cultures; proverbs are ‘bits of ancient wisdom’ and thus teach us about our own history. Drawing together proverbs that transcend culture, time and space to provide a collection that is both useful and enjoyable, The Routledge Book of World Proverbs is, unquestionably, a book of enduring interest.